Face-checking (splits in the veneer as shown in the images above) in decorative maple veneered plywood panels is a significant problem for hardwood plywood manufacturers and for users such as furniture and cabinetmakers. Efforts have been made by producers and academics to minimize checking. Research on the problem has been limited, and results occasionally contradictory. For example, one group of researchers reported that fewer checks developed in veneer oriented with the lathe checks towards the glue line (a.k.a. veneer oriented 'tight side out') whereas another group of researchers discovered just the opposite. Here we provide details on ongoing research to identify the combination of variables (veneer, adhesive, and core) that will minimize problems with checking as well as additional resources on this topic. 12"x12" test panels were constructed using all combinations of the above variables; 8 test panels were produced for each of the 96 possible combinations for a total of 768 test panels. All panels were exposed to a high heat/low humidity environment to induce checking. 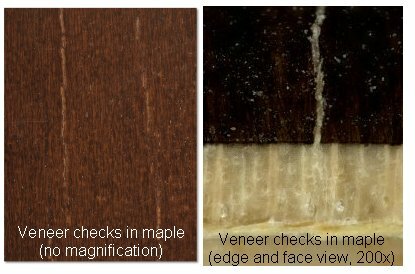 We've developed a new approach using Digital Image Correlation (DIC) techniques to identify checks in the veneer as they form. This method allowed us to examine an unprecedented number of variables and panels to gain an in-depth understanding of the primary panel construction variables that may lead to checking. The video below shows the process of producing test panels, placing the panels in the imaging chamber, and the image capture process. The video concludes with a time-lapse animation of check development in one test panel. Note: All veneer core panels were inadvertently created with the grain of the maple parallel to the grain of the core veneer rather than the industry standard practice of cross-lamination. Therefore the results reported here are primarily useful for combination core, particleboard, and MDF core materials. Veneer core panels will be recreated and results reported in follow-up research scheduled to be conducted in 2016. All 768 test panels have been produced and tested as described above. Findings indicate that checks developed in all but one of the 96 combinations of veneer type, adhesive, lathe check orientation, and core material. The one combination for which none of the panels developed checks was: 1/36" peeled veneer, PVA adhesive, veneer oriented loose-side out, on particleboard core. Further, findings suggest there is a significant 4-way interaction between all of the factors. In short, the findings suggest that there is no single 'optimal' combination of factors to lead to minimal checking in-service. Rather, the results will be a matrix listing specific combinations of core material, adhesive, veneer type, and lathe check orientation. The tables below provide that information, organized by adhesive type; shown in each table are the 'top 5' (least amount of checking) and the 'bottom 5' (greatest amount of checking). This project was funded by the USDA Special Grant program for Wood Utilization Research with generous contributions from the members of the Western Hardwood Plywood Producers - Columbia Forest Products, Murphy Plywood, Roseburg Forest Products, States Industries and Timber Products Company. Batey, T.E., Jr. (1955). Minimizing Face Checking of Plywood. Forest Products Journal. 5(10):277-285. Burnard, M.D. (2012). Key factors influencing checking in maple veneered decorative hardwood plywood. M.S. Thesis, Oregon State University. Burnard, M.D., L. Muszynski, S. Leavengood, and L. Ganio (2018). An optical method for rapid examination of check development in decorative plywood panels. European Journal of Wood and Wood Products (online, June 15, 2018). Cassens, D., Y. Leng, and G. McCabe (2003). Face check development in veneered furniture panels. Forest Products Journal 53(10):79-86. Christiansen, A. W. and M. Knaebe (2004). Diagnostic guide for evaluating surface distortions in veneered furniture and cabinetry. US Forest Service, Forest Products Laboratory, Madison, WI, USA. General Technical Report FPL-GTR-143. Forbes, C .L. (1997). Understanding and minimizing veneer checking on furniture panels. Wood Products Notes. North Carolina State University, Raleigh. NC, USA. Feihl, O. and V. Godin. (1970). Peeling defects in veneer, their causes and control. Publication No. 1280 Department of Fisheries and Forestry, Canadian Forestry Service, Ottowa, Canada. 18pp. Gilmore, R. C. and S.J. Hanover (1990). Suggestions for preventing or minimizing veneer checking. Wood Products Notes. North Carolina State University, Raleigh. NC, USA. Holcombe, R.A. (1952). Surface checking in furniture panels. Journal of Forest Products. Res. Soc. 2(5):122-127. Jayne, B.A. (1953). Finish Checking of hardwood veneered panels as related to face veneer quality. Forest Products Journal. 3(3):7-14, 91. Leavengood, S., J.W. Funck, and J.E. Reeb (2011). A note on face veneer checking in maple plywood. International Wood Products Journal. 2(2):120-23. Schramm, A. (2003). A complete guide to hardwood plywood and face veneer. Purdue University Press. Tremblay, C. and J.-F. Bouffard. 2012. Study on the issue of veneer cracking in the kitchen cabinet and furniture industry. FP Innovations Value to Wood Report FPI-11-01. 22 pages.